The tortoise population in the Mojave Desert is under threat. The main culprit? Humans. That’s the message Cody Hanford, executive director of Transition Habitat Conservancy (THC), told a packed house on Nov. 9 at Patagonia’s store in Old Pasadena about threats desert tortoises face and ongoing conservation efforts. Founded in Ventura, Patagonia sells sustainable outdoor clothing and gear for travel, climbing, trail running, hiking, fly fishing and snow sports. Last year, Patagonia’s Pasadena store selected THC as one of its grantees in its Action Works Retail Grants Program to help support their tortoise conservation efforts. The $9,500 annual grant goes toward THC’s native food gardens, a low-cost and low-effort habitat enhancement project that helps assist tortoise survival. Romeo Lodia, who runs the grants program at the Pasadena store, said each Patagonia store gets a fixed budget from the parent company per fiscal year, which runs from May through April. Organizations that apply through Patagonia’s website get funneled to the store closest to where they operate. Lodia said the Pasadena store selected THC for a grant last fiscal year and this fiscal year, which runs through April. The native food garden project involves angling corrugated metal sheets on the desert floor to concentrate falling water into one area to trigger native annuals to bloom, a main staple in the tortoise’s diet, rather than invasive plants. The result is that the target area receives more moisture at up to a 10:1 ratio. Patagonia Pasadena’s 12 other grantees include local environmental organizations, such as the Arroyo Seco Foundation and the Arroyo & Foothills Conservancy. THC, headquartered in Piñon Hills near Palmdale on the other side of the Angeles National Forest from Pasadena, is a nonprofit organization that focuses on land acquisitions and habitat stewardship in the West Mojave Desert. The conservancy has acquired over 7,000 acres of land and works to improve thousands of additional acres in Southern California. The California desert tortoise, or Gopherus agassizii, is the official state reptile and functions as a flagship, umbrella and indicator species found in southeastern California, western Arizona, southern Nevada and southwestern Utah. Along with Gopherus morafkai, found east of the Colorado River in Arizona and in the Mexican states of Sonora and Sinaloa, the two desert tortoise species inform scientists about the health of the Mojave and Sonoran deserts — and the prognosis isn’t good. Before white settlers arrived in the Southwest, there were between 50 to 300 desert tortoises per square mile. Now there are fewer than five on average per square mile, and often less than that. The population has decreased by 90 percent since the 1980s. They are effectively extinct in certain historic territories such as the Victorville, Palmdale and Lancaster areas. They have been listed as a threatened species under the Endangered Species Act since 1990, making it illegal to harass, collect or harm tortoises with penalties of up to $50,000 in fines and one year in prison. 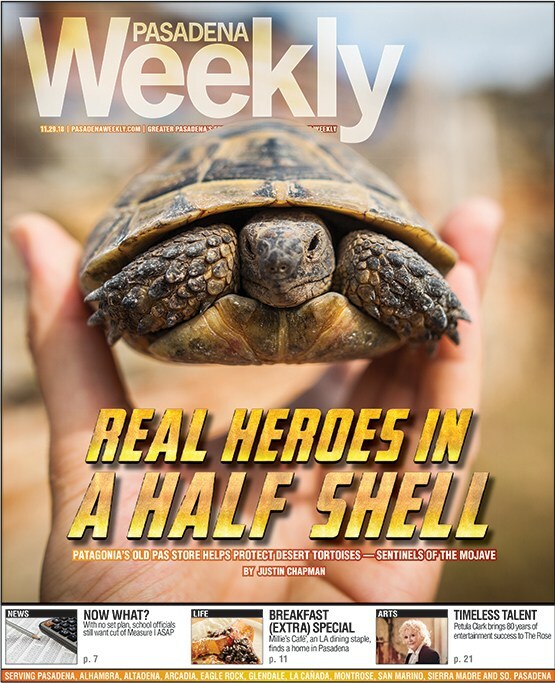 Military bases in the desert all have tortoise conservation programs because of its federally protected status. Berry’s remarks were part of the Mojave Project, an experimental transmedia documentary led by Kim Stringfellow, an associate professor at San Diego State University, exploring the physical, geological and cultural landscape of the Mojave Desert. The Mojave Project is part of Fulcrum Arts’ EMERGE Program, formerly known as the Pasadena Arts Council and still based in Pasadena. Stringfellow wrote in a KCET article that Berry is “the person perhaps most credited with gaining protection of Gopherus agassizii under the federal Endangered Species Act. There are many reasons for the tortoise’s decline, all of them directly or indirectly related to humans. Respiratory disease is the primary culprit; tortoises in captivity that are released back into the wild spread bacteria that makes wild tortoises lose their appetite and sense of smell. Poaching, cattle grazing and the increasing development of desert towns, roads, power lines and industrial wind and solar panels also threaten their habitat. Translocating tortoises has also been found to be disruptive and ineffective. The popularity of Off-Highway Vehicles (OHVs) such as dirt bikes and quads has exploded in the last 20 years, especially in tortoise habitat areas. And climate change is making conditions too hot and dry, even in the desert. Ravens are particularly challenging. The nonnative birds, which eat baby tortoises, have increased in the desert by 1,000 percent since the 1970s. There is a 95 percent mortality rate in the tortoise’s first five years of life, because they have to live to six in order for their shells to be raven-proof. Ravens have increasingly been subsidized in the desert by humans, who leave trash and build power lines where they nest. Hanford said THC and many other conservation groups are working to mitigate the impacts of these threats to desert tortoises, which he calls “mini-dinosaurs.” Indeed, the turtle form dates back 220 million years to the late Triassic Period. Wild desert tortoises can live up to 50 years and captive tortoises can live to 100. They hibernate from about October to March every year and spend up to 98 percent of their lives underground in burrows that they dig, which help support about 30 other species such as lizards, snakes and rabbits. Their extinction “would have a ripple effect across the desert,” said Hanford. In addition to purchasing land to permanently conserve, THC works closely with the Bureau of Land Management (BLM), other government agencies and other tortoise conservation groups to come up with creative solutions to protect this critical species. Those solutions include placing solar and wind installations in areas of the desert that are already disrupted, rather than disrupting new areas; erasing unofficial dirt roads that OHVs create; and using a 3D printer to create fake baby tortoise shells to discourage ravens from eating them. Hanford, originally from Tennessee, has been doing desert conservation work in California since 2003. He led desert restoration crews for the Student Conservation Association and worked as an environmental and land acquisition consultant for nonprofits, land trusts and federal, state and local agencies. In 2015, he started working fulltime for THC and became the conservancy’s executive director in 2016. There are several steps that visitors to the desert can take to minimize their impact on tortoises, Hanford said. Hanford and other tortoise experts also recommend adopting tortoises that are already in captivity. Captive desert tortoises cannot be returned to the wild because they develop and spread respiratory diseases. About 200 desert tortoises need to be adopted in Southern California, according to Linda Crawford, adoptions chair of the Foothills Chapter of the California Turtle & Tortoise Club, which coordinates adoptions in San Gabriel Valley. That chapter meets at 7:30 p.m. on the fourth Friday of every month in the Palm Room at the LA County Arboretum, 301 N. Baldwin Ave., Arcadia. Learn more at tortoise.org/foothill.